← Busdriver escapes from L.A.
New k-os album to be released in U.S. 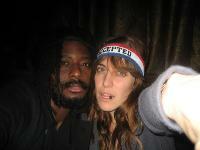 The last time Americans saw k-os (meaning knowledge of self) was at SXSW 2006, where he headlined a bill at Antone’s. Supported by a band that included, oddly enough, onetime Smashing Pumpkins bassist Melissa Auf Der Mar, he closed his set by announcing he would no longer record for Astralwerks, the EMI imprint that issued his first two critically-acclaimed albums. Some heads thought that this might be the last time the Canadian artist would get a full-fledged domestic release of his work and we’d have to find it on import, like most of Buck 65’s catalog. But we forget that k-os is a superstar in his country. When his new album Atlantis debuted in the top 5 of the Canadian albums chart last October, it was clear he’d get another chance to crack the U.S. market. And so it is that Atlantis hits our territory on February 24 via Virgin, another arm of the EMI conglomerate. The first single from Atlantis, “Elektrik Heat,” is already gathering spins on VH-1 Soul. You can check out a stream of the song and the video through the link below. This entry was posted in News and tagged K-os. Bookmark the permalink.